The collaboration of Syngenta with the Institute of Genetics and Developmental Biology (IGDB), Chinese Academy of Science has been gone through for five years. 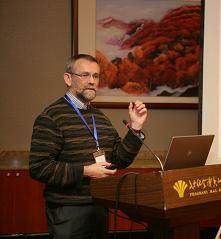 A workshop was successfully held on November, 10th, 2012 in Xiangshan, Beijing. The collaboration of Syngenta with the Institute of Genetics and Developmental Biology (IGDB), Chinese Academy of Science has been gone through for five years. 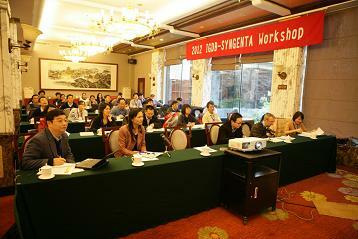 A workshop was successfully held on November, 10th, 2012 in Xiangshan, Beijing. Over 30 scientists from both sides got together to review the achievements of past five-year collaboration and also look forward into the future. The theme of this workshop is: review and prospect. Yongbiao Xue, the Director of IGDB, gave the opening speech and overviewed the collaboration history with Syngenta as well as the pomp of the collaboration agreement signing ceremony in 2007 and previous IGDB-Syngenta workshops. The precious moment captured by the photograph reminded him and all the experienced attendees of the great progress of the collaboration. David O’Reilly, the Head of SBC, presented an overall review in terms of the research projects up to date. Both of Dr. Xue and Dr. O’Reilly acknowledged and appreciated the win-win achievements from the collaboration. The following session was a group discussion regarding the lessons we learnt from the past five years. Participants warmly and actively shared their thoughts from both good and difficult sides as well as how we could improve in the future. Professors from IGDB gave the presentations related to their research area in the rest of the workshop. Dr. Chengcai Chu, the Principal Investigator at IGDB, especially emphasized that the scientific outputs instead of outcomes could only come from the combination of fundamental research and modern industry platform. A strong chord was struck by Dr. Chu’s speech. The afternoon discussion revolved around the topic about identifying the potential for future collaboration, such as new models, ideas, and technologies. ”Fewer collaboration in quantity but with more focused research goal will lead to better research in quality and result”, said Dr. Huabang Chen, the new Principal Investigator at IGDB who participated in this workshop first time.